Book Review: What to Expect about "What to Expect"
When I first found out I was expecting, I truly had no idea what to expect. While I have siblings, they are close in age to me and only one is younger; therefore, I never experienced the big sister-little brother maternal relationship that you sometimes see siblings take on. In addition, I have a small family with only a single cousin who is similar in age to my younger brother. To top off my unfamiliarity with all things children (especially babies! ), I was among the first of my close friends group to become pregnant... talk about limited advice on what the next 9 months held for me. In fact, I was the assumed source of answers for my curious friends. "What symptoms should you be having? When does morning sickness start? End? When do the cravings start? Can you feel he/she move? Can you drink coffee?" As every soon-to-be mom whose news is public can tell you, the curious cats start pawing for answers instantly. While you can certainly answer questions about your experience thus far - as every pregnancy is individualized - the new mom fears can definitely set in when the answers to the various Q & A sessions are missing! So, I did the most natural thing... started googling. I immediately determined, I was having twins with EVERY possible genetic disorder, while also suffering from a brain tumor and severe orthopedic issues that I would surely need surgery from in which I couldn't undergo anesthesia.. thanks to the pregnancy and all. Turns out, google isn't the best answer for all those mom-to-be questions (*side note: I have found a TON of mommy bloggers with some great advice and websites through googling, so the search engine can help out, just be wary of mommy forums loaded with opinions). 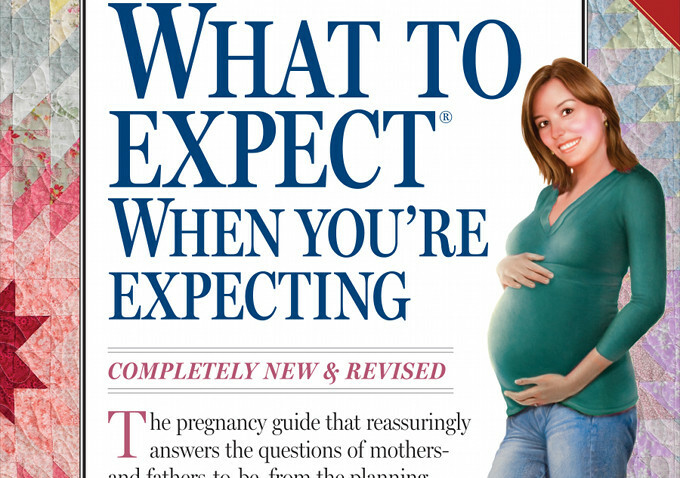 Luckily, shortly after we announced the pregnancy [and gender at our own Gender Reveal Party], my mom spoke the truest words to me, "You must read "What to Expect When Expecting". After a trip to the local book store, I had my very own copy of the pregnancy bible (authored by Heidi Murkoff and Shannon Mazel). I can say that now, having read it, but truthfully, I was skeptical of the book initially and gave into my mom's will for me to read it only so I don't have to keep answering that 'Have you read it yet?' question. I was skeptical mostly because I feel like the majority of expectation books on the market do nothing than state the obvious... although, after some news stories I've read lately, I am beginning to think stating the obvious of "babies rules" may need to be stated after all. That's a whole 'nother blog post. Anyway... back to the topic at hand. I opened the book, which is quite lengthy FYI, and to my surprise was sucked in immediately. Not only did it confirm all my common symptoms thus far, it touched on those I had yet to explain and had lingering questions about. The book is broken down by month of pregnancy. I purchased the book approaching month 4, and caught up in a few hour binge read session with a cup (or two... don't worry, less than my 12 oz. allotment) of coffee. The best part, in my opinion, was the reading ahead. I was so curious as to what the next five months would hold for me. After all, I had never done this before and was perpetually nervous I would screw it up. The book covers everything - from what happens to the baby each month, common symptoms and resolutions for those, what to expect on various doctors appointments, what tests to expect throughout the pregnancy, what's normal and what should cause concern (from a medical perspective), and what will happen to your body throughout all of this. The book is also written in a light hearted, friend-to-friend chat over coffee type voice, which I was very much a fan of. I'm not a doctor, so I want the laymen explanation of what some of the more serious medical diagnosis and test mean. There are a few excerpts throughout the book for dads-to-be, as well. Sections of the book are actually written in a Q&A format, much like a submitted question, too. Bottom line - many books on the market (and blogs/forums/articles online) use the approach of "What you don't know" or "What no-one told you". That's exactly what I wanted to know. I wanted the details - the good, the bad, the ugly. This book actually tells you all of that, not just sucking you in with a gripping headline. I truly feel that I know what's "normal" or what should cause concern from a medical stand point, but also what to expect - pun intended - moving forward with my pregnancy. I'm a fan of surprise gifts, but not of surprises with things happening to my body and this book helped alleviate a great deal of my worrisome nature and prepare me for the remainder of my pregnancy. In fact, I've actually moved on to the next installment in the series: "What to Expect: The First Year; 3rd Edition" by the same authors, Heidi Murkoff and Shannon Mazel. This book, too, proves to be packed with information, but I will say the interest on the first year isn't as heightened as the interest for the remainder of my pregnancy yet. However, I am entering the third trimester next week, so I think that interest will grow as my due date nears and this book will prove to be just as valuable. When I wrap up this one, I plan to move onto "On Becoming BabyWise" by Greg Ezzo, which I've heard new moms swear by for training newborns to sleep through the night. I do NOT do well without sleep, so this is a top priority read for me before due date! This book is one of nine in the series, so I'll plan to review my thoughts on book 1 and see is the rest are worth the investment.